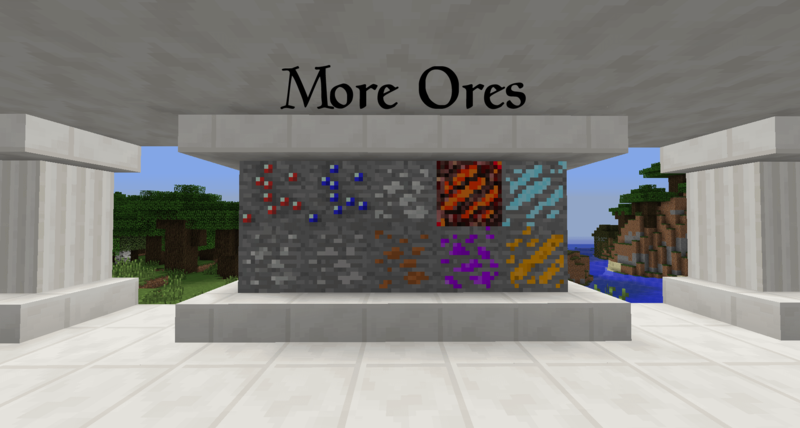 More Ores, or M'Ores, is a mod that focuses on adding new ores into the blocky, Minecraft world! Check out my website for more of my work! You cannot re-upload or modify this mod without advanced written permission from me, the mod author, mrRobertman. You can use this mod in a public modpack, if A) the modpack has at least ten mods, You have to link to either, here, Curse Forge, or Weebly Website, and C) You give me full credit as the mod author. Japanga for being there and helping me out! Not a big fan of Ore Mods but this one looks Cool. Also i know a fix for Nether Ore Spawning. I am trying to add armours in the next version, so far it is not working. Oh and what is the fix for Nether Ore Spawning? I would like to know so I can fix it for the next version. I lost the src code i Had wich had Nether Generation. Look up Wuppy Gaming's Tutorial. Yeah I tried Wuppy's Tutorial, it didn't help, I must be doing something wrong, I don't know what. I will try again, but for now, M'ores V2 will be out tomorrow! so Create the "armor" folder into mcp/src/minecraft And put the armor-player skins there. Huh, It doesn't seem to work for me. I have no Idea what I am doing wrong! Well I tried it again, I got it working, but no textures. I can't seem to get the textures working. How would I do the textures properly? Would I create a file for my armor, or can it work by just importing ItemArmor? I have tried both ways, neither fixed the texture. Need to create a file for nameHelmet but it's basically the Item Texture ,ModLoader.addArmor("TEXTURE") Is the texture on the player. It didn't do anything, any other suggestions? Hmm, that did not seem to work. The Icon didn't even show up when I used that code.